Brianne Rohner Erickson is a trial attorney and associate at Brock Law Offices, P.C., L.L.O., where her practice is primarily dedicated to representing injured individuals in the areas of workers’ compensation and personal injury. Ms. Rohner Erickson earned her law degree from the University of Nebraska College of Law and she is licensed to practice before Nebraska’s state and federal courts. She is a member of the Nebraska State Bar Association, Nebraska Association of Trial Attorneys and Workers’ Injury Law & Advocacy Group. Ms. Rohner Erickson grew up in York, Nebraska. She graduated from Nebraska Wesleyan University where she was a member of Delta Zeta Sorority and received an award from a prominent international attorney as the most outstanding graduating history major. She graduated in 2006 with a Bachelor of Arts degree in History. Ms. Rohner Erickson spent four years practicing workers’ compensation and personal injury law at another Lincoln firm and joined Brock Law Offices in October, 2015. 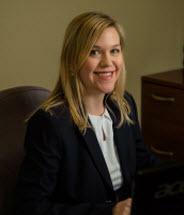 Outside of her law practice, Ms. Rohner Erickson enjoys spending time with her husband, family, friends and her dog. She also enjoys cooking, reading, participating in outdoor activities, attending concerts and sporting events, traveling, and she recently ran in (and finished!) her first half marathon.